from The Kitchen Diaries, p. 16-17. At the end of the year, I put post-it notes in The Kitchen Diaries on the pages at the head of each month that contain lists of that month’s recipes. I’m starting the book all over again. Too many recipes to take in on the first circuit. What I sampled makes me want to keep the book around for the next decade. But this second time around I intend to reduce his recipes to appropriate proportions for one serving (ok, maybe two for leftovers). His recipes lend themselves easily to adaptation. Tonight I felt the urge for something warm and comforting. Onion soup — especially now that I am recently returned from Paris — seemed to fit the bill. Set the oven to 200 C [about 400 F]. Peel the onions and cut them in half from tip to root, then lay them in a roasting tin and add the butter, salt and some pepper. Roast until they are tender and soft, and toasted dark brown here and there. You might have to turn them now and again. Cut the onions into thick segments. Put them in a saucepan with the wine and bring to the boil. Let the wine bubble until it almost disappears (you just want the flavour, not the alcohol), then pour in the stock. Bring to the boil and simmer for about twenty minutes. Just before you want to serve the soup, make the cheese croutes. Cut the loaf into thin slices and toast lightly on one side under a hot grill. turn them over and sprinkle with the grated cheese. 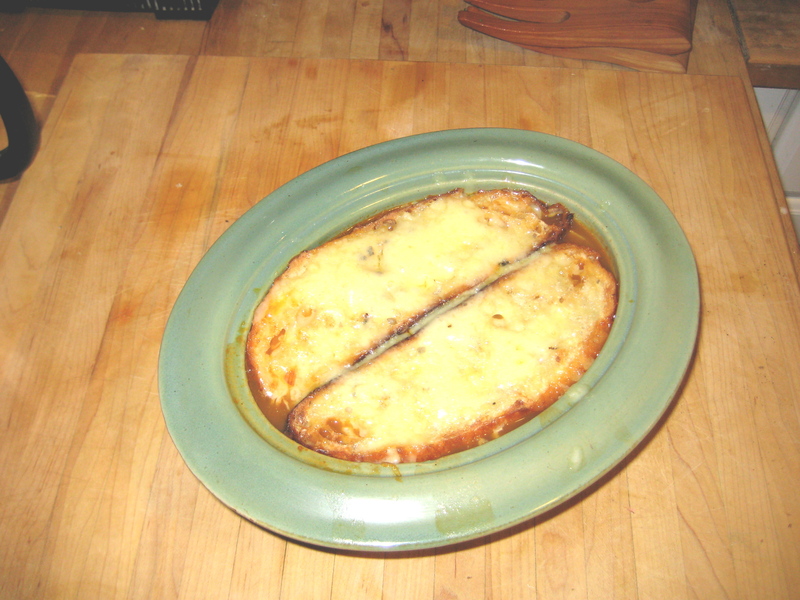 Get the coup hot, ladle it into bowls and float the cheese croutes on top. Place the bowls under a hot grill and leave until the cheese melts. Eat immediately, whilst the cheese is still stringy and molten. Enough for 4 my arse. Nigel is being unusually parsimonious. Most of his recipes will feed twice as many people as his servings call for. Here, he underestimates his portions. I halved most of the ingredients and ate most of it. My version goes like this. I cut the onions as he prescribed and placed the four halves, cut side down, on a sheet of aluminum foil on a baking sheet. I placed a little bit of the T of butter under each halve. Then I sprinkled kosher salt and grated some pepper over the halves. The onions took about 30-40 mins to reach the point where I thought they were soft enough, caramelized enough, and sweet enough to enhance the soup. Once I transferred them to a cutting board, I trimmed the root ends and sliced them with the grain into not especially thick segments, as Nigel recommends. Into the saucepan with a full complement of one cup of wine they went, where they simmered furiously until the wine was nearly but not entirely boiled away. At that point, I added the nearly 3 cups of veal stock I had defrosted yesterday. I brought it all to a boil and set the timer for 20 mins. In the meantime, I grated a bit of Emmentaler and cut two slices of bread. While the bread toasted until the grill (as Nigel the Brit calls his broiler), I quickly grated the cheese. I removed the bread from the oven, poured a generous but not piggish helping of soup into a serving bowl, placed the bread, toasted side down, on the surface of the soup, and strewed the cheese over the top. Under the broiler for less than five minutes and it came out perfect. I was happy with how the soup came out. Still, I wish the flavor had been more intense. I think everything about onion soup depends on the intensity of the stock. Somehow, I can’t imagine the soup working well with vegetable stock, but I might be missing the point. It may be a point I’m willing to miss. This recipe motivates me to work on my veal stock recipe. I think you might be right about the stock. Onion soup calls for good beef stock. I’ll try this one with stock I just made. On a related note: I’ve never made veal stock so I need some enlightening. My impression is that veal stock would be very mild tasting. Yet I see it called for in so many recipes. What’s the attraction? It’s not especially light in flavor. I find the difference between beef and veal stock to be one of taste. I’d say that veal stock is rich and adds a dimension to a sauce or soup that’s more complex than beef stock. Yesterday, I made a stock out of a roast chicken carcass and then made a soup out of escarole, white beans, and chopped prosiutto. Really good. I may post that eventually.